I’m usually really good about making a to-do list and sticking to it, but not today. I was supposed to be home after work so the neighbor could borrow my lawnmower and cut both our lawns, but I had to pick up something on hold and decided to take advantage of my time by getting some errands done. I had a very busy, but productive day including paying a bill. Not my favorite things to do, but it had to get paid. By the time I got home tonight, it was around nine o’clock and I hit tired. Once I put everything away, crashed for a brief amount of and ate again, it was time to get today’s card done and posted. So, here it is. It’s inspired by shorts and a shirt. I am too tired to design tonight, but the pattern and color combination of the outfit made it easy for me to create a card. 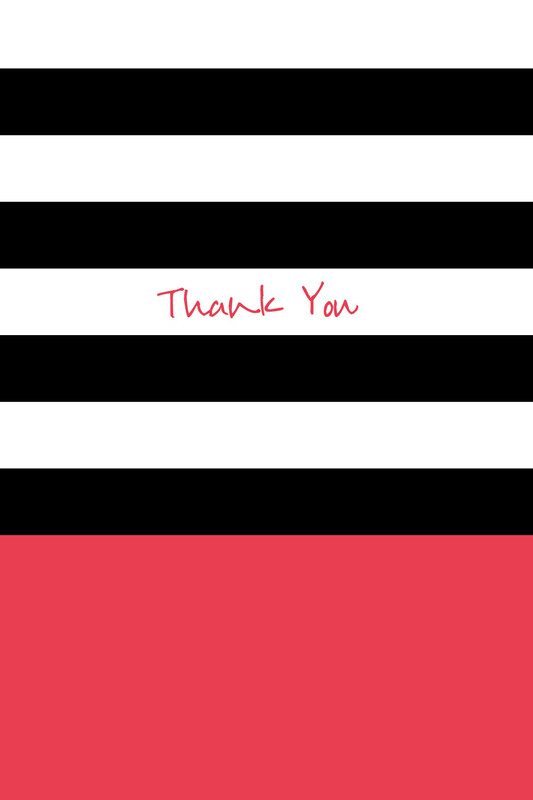 This entry was tagged black, blog, blogs, card, cards, colorful, colors, design, graphic design, pattern, patterns, pink, stripes, Thank you, thank you blog, thank you card, thank you card blog, thank you cards, white. Bookmark the permalink. Thank you very much for sharing nice digital sign article. I like it.